During March Madness, you either do it or you don’t do it. Your team either makes it, or it doesn’t. It’s that simple. During a one-game sample, as in any sport, often times the better team does not win. All it takes is one cold shooting night (or one hot shooting night from the opposing team) to dash one’s dreams and divert their attention to the oncoming baseball season. For Duke (33-4), Sunday’s Elite Eight victory against second-seeded Gonzaga (35-3) was a triumph on multiple levels, but none as important as the bottom line, which was simply winning the game in the first place. It was a slug-it-out type of affair throughout, with Duke parlaying a 13-1 run at the end of the game to eek out a 66-52 victory. What a team, and what a year for the Blue Devils. Justise Winslow has been Duke’s most valuable asset during the dance, averaging 14.0 points, 9.5 rebounds, 3.3 assists, 1.8 blocks and 1.5 steals per game, a complete line for what has turned into the team’s most complete player. More surprisingly for the Devils was winning without much production from its best offensive player, Jahlil Okafor, who failed to crack double digits in scoring in both the regional semifinal vs. Utah (6 points) and final against Gonzaga (9 points). With some of the best scoring ammunition in America, the Blue Devils reached the Final Four by winning ugly, scoring 63 and 66 points, respectively, against an under-seeded Utah team and Gonzaga, who in many circles was favored to take Duke down. Given what was on the line, Sunday’s win over the Bulldogs was the Devils’ biggest of the season. That’s just the way it goes in March. However, led by three potential lottery picks (Okafor, Winslow, and possibly Tyus Jones), this Duke team wasn’t a stranger to big games this year. 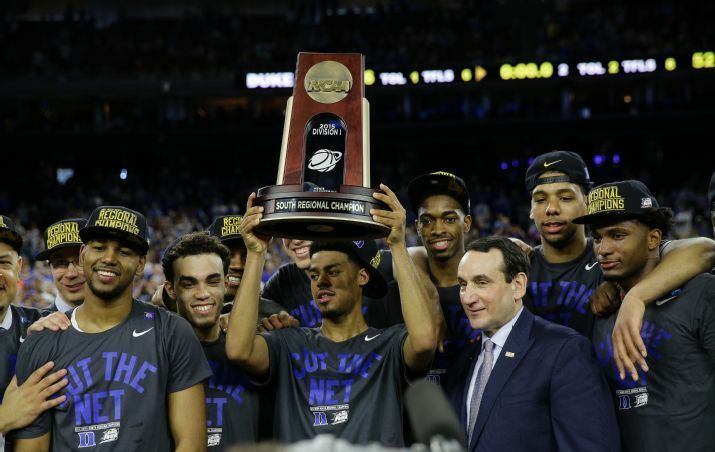 Against 2015 Elite Eight competition alone, Duke had wins over Louisville (on the road), Michigan State (neutral), Wisconsin (road), Notre Dame (home), and obviously Gonzaga. They also defeated Virginia in Charlottesville, back when they were undefeated, and swept the season series versus in-state rival North Carolina. There is nothing cheap about Duke’s gaudy 33-4 record, but it’s particularly worthwhile now that they are in a Final Four. For historical purposes, unless Duke made a deep run in the NCAA tournament, the season would have been remembered more as Jahlil Okafor’s one year in school before a dominant NBA career. See, in spite of a bunch of great wins, until Sunday’s South Regional championship, the Blue Devils didn’t have a lot to show for this year. They finished second in the ACC to Virginia, and were upset in the conference tournament semifinal against Notre Dame. This team had no titles, no confirmation of their consistent excellence. The dream scenario is [Duke] win out and meet an undefeated Kentucky team in the National Championship. There isn’t a better, more must-see matchup than that. The national player of the year (Okafor) against what will go down as one of NCAA Basketball’s best teams of all-time if they win it all (Kentucky). Whether Duke wins out or they don’t, I’ve enjoyed this team as much as any since the 2001 Championship squad. In this era of one and done’s, Duke’s freshmen have balanced their transience by providing strong memories for me, and now they are two games and 80 (or a few more) minutes of game action away from a Championship and one of the great (sort of) upsets of all-time if it’s against Kentucky.